While Josh was away, we watched a lot of Downton Abbey, I watched a lot of Nashville, I baked French bread for the first time, I baked a blueberry cake, I did laundry, and I purged my closet. While Josh was away, I stayed up unusually late so I was so tired I would fall asleep. I have such a hard time falling asleep when he’s not in the house. While Josh was away, I was thankful for all he does at home… as I made my own lunches and did the dishes; two important tasks he usually does for me. While Josh was away, we had amazing thunder storms. I found myself so satisfied with my time spent baking, the uninterrupted introvert time by myself, and I even enjoyed missing him. [Wait… WHAT?] No, missing him is not fun, but I’m so glad I do miss him. I’m so glad we have responsibilities and that we feel the weight when one of us isn’t able to carry theirs. I liked the feeling that I can do these things by myself, I can be independent, but I don’t have to be. I get to share these mundane responsibilities and moments with my best friend. Josh has been avoiding desserts for the month of June. Out of respect for his resolution, I have not baked any sweets… but this weekend I had a reason: family cookout. Oh, how I love to bake. I love the challenge, the precise measurements, the smells, the satisfaction of a cake well iced. And, I will admit, I love sharing what I’ve made with others. 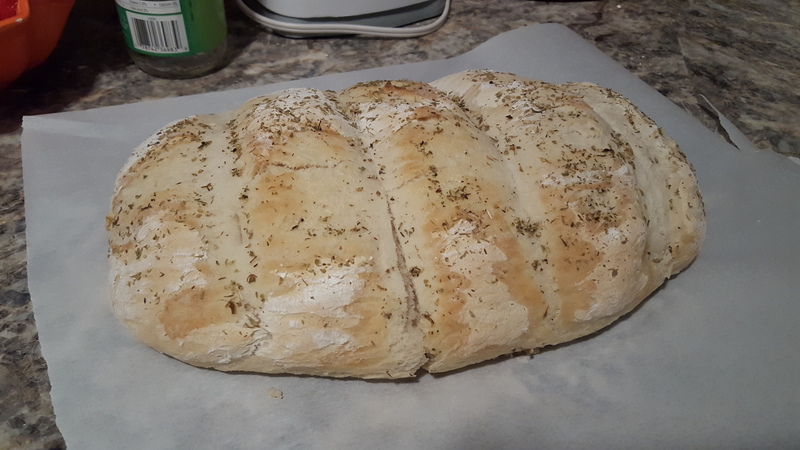 I also made the must unbelievably easy and delicious french bread… I’ll have to share that recipe. I dropped Josh off at the airport on Thursday morning. It was a LONG day. I woke up at 2am, left the house at 5am, and was at work before 6am. Thankfully, my bosses let me come in early, work all my hours, and go home. Oh, I enjoyed those hours at home… it’s not every afternoon I get to lay in bed and watch Netflix! 🙂 After a few day of the aforementioned baking, TV shows, and introvert time, I picked Josh up from the airport on Saturday evening, and we had a feast of chicken burritos. I tried a new recipe (chicken broth, ranch seasoning and taco seasoning in the crock pot), and naturally it was delicious. On Sunday, we went up to Richmond for a family cookout! Despite the best burger I have ever had in my life, we enjoyed spending time with family. I’m thankful our family lives so close that we’re able to visit for a day (in this case), or a weekend (in most cases). The past few days have been… long and difficult. Work has been rather insane, processing billings, cleaning up the books… it’s one of those weeks where every time you cross something off the list, about 5 things get added. BUT there are so many things to be thankful for, despite the crap of recent days, weeks, and months. For instance: I have freshly baked bread and cake at home. I have a job… not just any job, but a job where I am vital and valued. Because of my perfectly timed raise, we were able to purchase a plane ticket for Josh to go to Wisconsin. I am gaining valuable accounting skills at work. I finally found the perfect black maxi skirt, and I BOUGHT it. It is so so so easy to focus on the pain, the struggles, and the un-fairness… isn’t it? I accept the challenge of positive thinking, and counting my blessings. Last night we had a cook out with several growth groups from our church. I was, honestly, not looking forward to it. I’m not good at small talk, and I have been wiped out from the last couple of days. Thankfully, I was surprised by how much fun I had. We played bocce ball, had burgers, and met a lot of people. I am so thankful for the timing of my raise. I’m thankful that we were able to afford this trip, and that you were able to support and encourage your family while you were there. Next month we’ll destroy the loans… this month was about investing in family. Mostly, I’m glad you’re home and I can’t wait to spend time with you tonight, and to spend time with you this weekend!